This Demonstration displays the Platonic solids, the Archimedean solids and their duals, and the Kepler-Poinsot polyhedra. 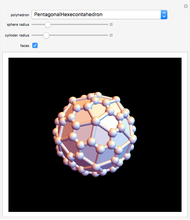 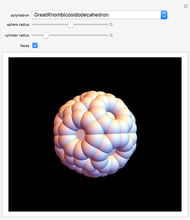 You can make the faces disappear or change the radii of the spheres and cylinders used for the vertices and edges. Russell Towle "Polyhedra, Spheres, and Cylinders"